* 2015 Update -- Boulder Daily Camera Quotes Bob on Hern: see below. - 2018 Update -- Warren Hern on trial in Denver. Really! HERN: Abortion has to do with fundamental decisions people make about their lives... Of course the public debate is about who is going to make that decision. The individual or the state. ENYART: So women and families should make the decisions, these life or death decisions? ENYART: Did you notice the news story this week; some doctors went to a judge to try and appoint a legal guardian for a woman who was in a coma? Her husband wanted to continue medical treatment. HERN: Yes, I saw that. ENYART: But the doctors wanted to cancel medical treatment. ENYART: Would you have agreed with that judge, then, that no, those doctors didn't have a right to appoint a legal guardian? HERN: No, I think the doctors were doing the right thing and I support the doctors' point of view although I'm not involved in that case and it has obviously nothing to do with abortion. But I think it's absurd to maintain someone on life support systems when they are not even functioning. ENYART: So even though the family wanted to continue to medical care, you would have taken that decision away from the family? HERN: Well, I think that is, a, I, I thought we going to be talking about abortion. This is really not a question I was prepared to discuss. It's clearly one in which I have interest in, and it relevant, but why don't we stick to abortion. This transcript, first published statewide in the Denver Catholic Register, alerted a hundred thousand families to the truth that abortionist Warren Hern unwittingly admitted: that it is people like him who should decide who lives and who dies. The pro-abortion American Bar Association summarized the case as "the first attempt in the nation to wrest control of a patient's fate out of the family's hands." Oliver Wanglie wanted to continue care for his 87-year old wife Helga, as did their two children and other doctors at the same hospital, yet they were dragged into court by two Minneapolis doctors and the hospital that was trying to get the state to overrule the family. This case illustrates the deception of abortion and euthanasia advocates who claim to believe that these "life and death decisions" are for the family and individuals to make, when in reality, they will urge the state to come down against the family on the side of killing the innocent. The family should be overruled by the government imposing the euthanasia and abortion industry's decision to euthanize (or abort) the innocent, including our own loved ones. This is the actual belief system of this nationally-known abortionist. By claiming to be "pro-choice," he is a liar. The entire Planned Parenthood organization, by extension and evidence, also lies about its own position. The abortion industry's lack of action against, and even arguably its funding of, China's forced-abortion program proves that Planned Parenthood itself is not even "pro-choice" but simply pro-death. 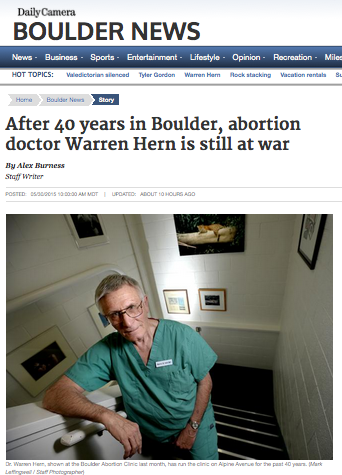 Abortionist Warren Hern violates even his own immoral standard, and would usurp the family's supposed right, and give that power to the government, to "make that decision" regarding life and death. The truth is that the abortion and euthanasia leaders believe "unwanted" human beings should die. The family's desire is irrelevant to them, unless it coincides with their own desire to kill the innocent. Hern collects himself and, with cutting, dead-serious eyes, says, "You see why I hate these people? I hate them." He repeats that twice more under his breath. "I hate them. I hate them." Bob Enyart — radio host, Denver Bible Church pastor and spokesman for Colorado Right to Life — roundly condemns the killing of abortion doctors but says there is "no justification" for their role in "the long war against God." Even in cases of fetal anomaly, he says, "It's never a thorny issue whether to love a child. "You don't love the child by killing it, and you don't love the mother by turning her into an accomplice," Enyart says. "Warren Hern is not motivated by a desire of freedom for the woman and her family. As with the left generally, his is a worldview of killing the innocent and protecting the guilty." * Register for Bob Enyart's Hermeneutics Seminar or Get the CD! Come on out at 6:30 p.m. Wednesday April 29th to Denver's Brown Palace to enjoy Bob Enyart's Hermeneutics seminar on Tools for Studying the Bible! Registration is only $30 for a person (anyone from the moment of the beginning of their biological life) and $50 for a couple (a man and woman that is :) ! If you can't attend, you can purchase the Hermeneutics seminar on CD for $34.99. Just call the BEL studio at 1-800-8Enyart (836-9278)! Typology: people, events, objects, rituals, etc. serve as symbols of Christ, salvation, heaven, etc. Numerology: numbers at times are symbolic: 3 for God, 6 for man, 12 for Israel, 40 for judgment, etc. Today's Resource: SPECIAL: Order on five CDs for only $99.99 and save! Now, you can listen to all five of Bob Enyart's The Plot Bible Study Albums on CD for a low price of $99.99! If you've never listened to Pastor Bob Enyart's Bible study seminars on The Plot, The Tree, and the companion studies titled The Law of Moses, The Last Days, and Details Galore (on miracles and healings), you owe it to yourself to order The Plot Audio Set right now to enjoy Bob's best-selling and extraordinary studies on understanding the Bible and living the Christian life! (Or, read the book!) And remember, BEL offers a 30-day money back guarantee on our resources!